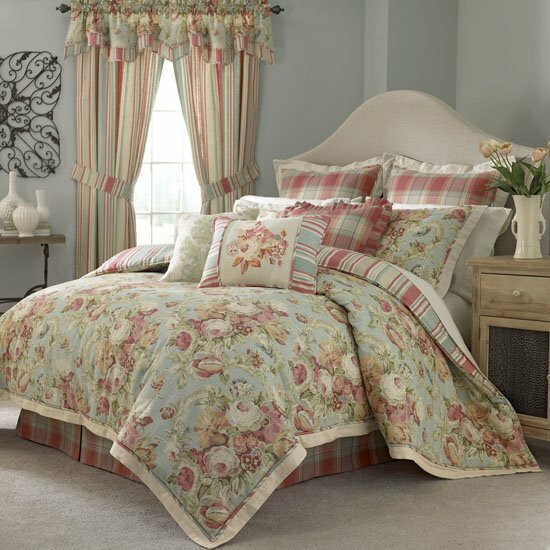 Waverly Spring Bling Comforter Sets & Accessories | PC Fallon Co. Create a lovely, serene bedroom with vintage bouquets in soft colors of muted red, blush pink, vapor blue, parchment, taupe, and sage green. Spring Bling bedding by Waverly has leafy vines twining around roses, peonies, tulips, primroses, and other flowers on a pale blue background. The comforter is made of woven linen/cotton, adding textural interest. A coordinating stripe is on the reverse of the comforter, and also appears as decorative cording trim on the edge of the comforter and the shams along with a solid cream flange border. The tartan plaid bedskirt has 5 box pleats for a tailored, designer look. Each set includes one reversible comforter, one tailored 5-box pleat bed skirt and two pillow shams (21" x 26" for the queen and 21" x 36" for the king). Euro shams are done in plaid with a stripe binding trim and solid cream flange border. Complete your bed ensemble with a mix of accent pillows including a 20" square plaid pillow with pleated ruffle edge, an oblong pillow with center embroidered panel and stripe ends, and a 16" square leafy embroidered pillow. Add pattern to your window with a floral and stripe scalloped valance and stripe draperies. The comforter, shams, bedskirt, valance, and drapery panels are machine washable for easy-care. Floral fabric 55% linen/45% cotton. Stripe fabric 100% cotton. Imported.